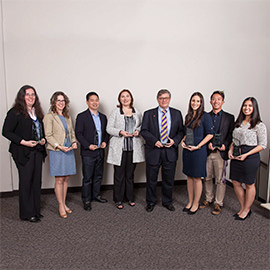 Laurier’s sense of community and purpose were on full display at the recent Wilfrid Laurier University Alumni Association (WLUAA) Awards of Excellence ceremony in Waterloo. From students giving back to their local communities to an alumnus who is changing how Wall Street works – the annual celebration demonstrated the diversity and dedication of Laurier’s alumni, faculty, staff and students. Alumnus of the Year, Brad Katsuyama (BBA ’01) has become the catalyst of Wall Street reform since uncovering and solving a systemic high-frequency trading problem in the stock market, affecting millions of people. He received international recognition and was the protagonist in a best-selling book: Flash Boys: A Wall Street Revolt. Selflessness and service were overriding themes for all of the award recipients. Young Alumna of the Year, Michelle Gould (BSc ’12), enrolled in Laurier’s inaugural Health Sciences program when she was just 15. Now at age 22, she is a first-year pediatric resident at Sick Kids Hospital in Toronto, where she is studying celiac disease, a condition that affects approximately one in 100 Canadian children. The event also included presentation of the Tom Berczi Campus Citizenship Scholarships to seven students. The awards honour former Alumni Association president Tom Berczi and recognize students who combine academic achievement with generous volunteer involvement within the Laurier community. Learn more about the Awards of Excellence program and past recipients.